All feats are both Canon and Legends to bring out their full potential. Anakin. Lightsaber skill might be even, but he is faster and more powerful. How does RotJ Vader win though, tbh? He was unable to break through the defenses of Kenobi who's supposedly a shadow of his former self and gets bested by TPM Maul in sabers. Sure, Vader was pre-prime, but how big do we judge his growth to be? Dooku as of AotC was said to be superior to TPM Maul then grew stronger throughout TCW, yet RotS Anakin pummeled him to kingdom come. And Anakin was just beginning to accept his fury and inner darkness at the time. He grows even stronger afterwards and only fully embraces the Dark Side once Sidious deems him as Darth Vader. There has to be an enormous improvement from ANH to RotJ to make up for that gap. I'm not saying it was impossible for Vader to have improved, I'm just looking for evidence to support a growth that large. @dawn_of_ages: Legends Vader was vastly more powerful than his movie showings. All things indicate that suit Vader only gained mastery & strength over his time post ROTS. There is even a recent comic showing where suit Vader absolutely wrecks what looks like a ROTS Anakin. It was a Vader force vision, which maybe plays to the end result a bit, but it does exist none the less. Legends Vader only fully embraced the dark side years after his turn, and it is at that point Vader truly became a force to be reckoned with. Having a canon and legends discussion with Vader is almost impossible to determine tbh.There is direct conflict between Canon and Legends Anakin/Vader. In Canon, Vader is more powerful than Anakin. In Legends, Vader is barely comparable to Knightfall Anakin. I guess using feats, Anakin wins, since Legends has all the feat based showings. The two contradict each other. IIRC, canon says Vader only improved whereas legends says he was hindered. Anakin should win. @g_race said: @dawn_of_ages: Legends Vader was vastly more powerful than his movie showings. No he isn't. Nothing deviates from the movies in Legends. Ben Kenobi is still a good match for him in legends, Luke presses him slightly in ESB, and still equals him in RotJ Legends. Can you name some examples of him being "vastly more powerful" than he is comparing what he does in the movies? In Legends, he still practically loses to Maul by ANH. All things indicate that suit Vader only gained mastery &amp;amp; strength over his time post ROTS. Only words which are pretty much referring to suited Vader. It's great that "he grows", but can you quantify this somehow? There is even a recent comic showing where suit Vader absolutely wrecks what looks like a ROTS Anakin. It was a Vader force vision, which maybe plays to the end result a bit, but it does exist none the less. That is a vision, so it is pretty meaningless. It refers to the struggle within Vader's mind. Anakin will never "beat" Vader like that until RotJ. Vader also oneshots the entire Jedi council together including Yoda and Mace. That doesn't mean he could actually do it. Legends Vader only fully embraced the dark side years after his turn, and it is at that point Vader truly became a force to be reckoned with. Could you rephrase that? Also, can you explain what you mean by Vader truly being a force to be reckoned with, like, compared to who? My level of pursuit in and among debating the comic vine community is very low, a simple respect thread search has me standing by what I had said. Credit to whoever originally posted these things there are MUCH more. Simply put the guy grew in power and could dust his former self IMO. This duel was very different from their last. Obi-Wan was older and weaker while Vader was even stronger, fueled by hatred and thirst for revenge. As his control over the dark side deepened, Vader grew increasingly contemptuous of his previous life as a mere student. The Dark Lord possessed immeasurable power, and unquestionable authority. His power was great, now, greater than it had ever been. It shimmered from within, and resonated with the waves of darkness that flowed from the Emperor. No. my level of pursuit in and among debating the comic vine community is very low. I see, sorry lol. Vader can't really win in my eyes, since everything attributed to him in legends post ANH is just him growing in power and becoming a "more formidable opponent". He compares Luke to Anakin in raw power slightly before RotJ, but that's all I can think of as a comparison. Meanwhile, Anakin is compared directly to Sidious and Yoda in ROTS, and curbfondled Dooku's face. @keencraft: Forgive me if I jack ‘Curbfondled’ to use in future threads, what a beautiful term. Anakin. While Vader can certainly make him sweat in a Force duel, he won't win, and in sabers he's impossibly outmatched. @keencraft: Did you see the respect thread attachments? I just posted some reasons. The first two quotes you provided say Vader was stronger than he was on Mustafar which considering his mental state and the fact that he was equalled by Kenobi it isn't much to boast about. The quote says Vader grew contemptuous of his former life as a student not that he was stronger lol. This is Vader's own fallible character opinion lol which considering he viewed Anakin as weak as shown by the quote you provided and the films you have to take it with a grain of salt. Not to mention almost all the sources you used are false as all apart from the last one are pre-ESB and as of ESB Vader still was not as strong as Anakin per George Lucas himself and George Lucas's opinion overrules C-Canon sources such as the quotes provided. So to your own point wouldn’t 1,2 directly reference a KF Anakin!?! I happen to disagree &amp;amp; frankly couldn’t care less which version is stronger. THat said to me Vader has superior force power and a more level saber attack approach. Also you cherry picked the argument about his past life. It clearly states he has immeasureable power now..
My bad, didn't see the edit till now but thanks for the retag. I noticed Arkham basically summed it up very well, but I figured I should show the courtesy of responding. He is more experienced, of course, but he is only more powerful than Mustafar Anakin, who was hindered and "between worlds". He wasn't Knightfall Vader when he fought Obi-Wan. He was barely able to block Kenobi's Force push at this time. This alone is telling. The comparison is referring directly to his power during their duel. Possessing immeasurable power is cool, but that just means he is pretty powerful. Many people get quotes like that, what does it mean? He also notes that he grows contemptuous over his life as Anakin "a mere student". Any comparisons he personally draws over his old self are likely to be flawed. Ie. "Anakin Skywalker was weak", which he says in many different stories, from canon and legends. The quote about his prime is likely to be referring to his prime as suited Vader, not Vader in general, who he feels a disconnect between. Not only that, but the power he is feeling is being amplified by the affects of Sidious, who is a dark side nexus. He is being rushed with energy that isn't his own, so his in universe account isn't accurate to gauge this as his "prime"
"We've actually never seen real Jedi at work, we've only seen crippled half-droid half-men and young boys that have learned from these old people. 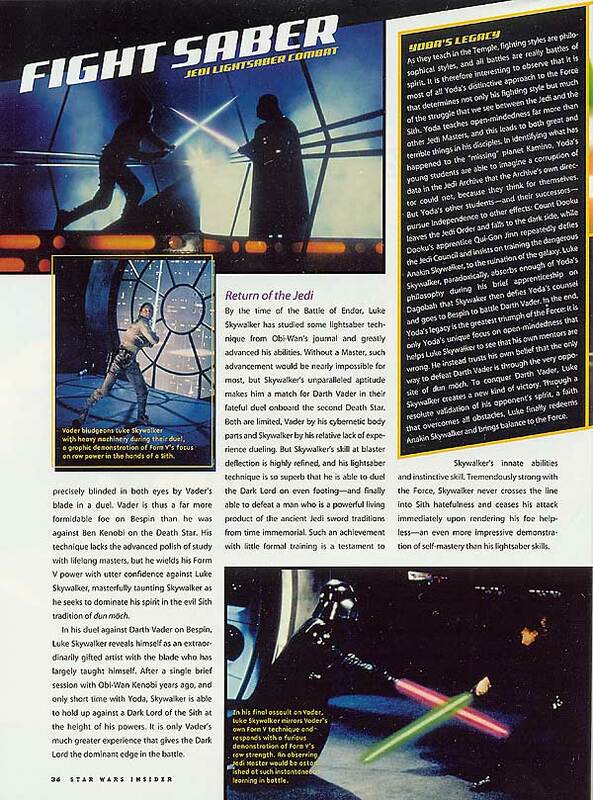 So to see a Jedi in his prime fighting in the prime of the Jedi, I want it to be a much more energetic and faster version of what we've been doing"
"When Obi-Wan Kenobi duels his former apprentice Darth Vader aboard the Death Star, both combatants know they are but shadows of their former selves." During the fateful duel with Darth Vader aboard the Death Star, the tall and powerful Sith Lord cannot break Obi-Wan's defenses until Kenobi voluntarily yields. He did not wish them to interfere, but to even warn them of would take concentration that he could not afford at the moment. Should his attention falter, Obi-Wan could kill him in the blink of an eye. pretty much contradict anything about Vader being more powerful than Anakin at least by ANH, which these quotes are referring to as him being supposedly more powerful. There would need to be an incredible amount of growth between ESB and RotJ in order for him to go from being TPM Maul/Old Ben to ROTS Sidious and Yoda. It can't be established. @keencraft: From this day forth, may I please utilize the term "curbfondled" as well? No. Vader as of Mustafar was much weaker than he was during Kinghtfall due to mental hinderances. I was talking about Vader being better than ROTS Kenobi and said it's not much to boast about. I never said you were boasting. You haven't provided an argument here as to why you disagree. Him having immeasurable power doesn't prove anything lol. It's a hyperbolic accolade which has been ascribed to many characters. We very clearly can measure Vader's power as 80% of Sidious's per Lucas. Go forth with my blessing, my friend. Spread with haste and fury the curbfondlage for all to witness. As you wish, Lord Keencraft. Legends only, RotJ Vader. Greater lightsaber duelist, vastly more powerful in the Force, and overall a more effective combatant. and overall a more effective combatant. I'm backing Vader here. Lol. @g_race: Was going to respond but @keencraft pretty much summed it up and @arkhamasylum3 addressed the issue regarding the quotes. It's highly doubtful that he surpassed RotS Anakin when he's unable to overcome an out of prime Kenobi. Again, no ones denying that he improved, but so far there seems to be no evidence to suggest such a colossal improvement that he goes from losing to TPM Maul, to obliterating RotS Dooku. No. Vader as of Mustafar was much weaker than he was during Kinghtdfall due to mental hinderances. Any actual evidence that comes anywhere near showing Vader on Mustafar being "much" weaker than KF Vader would be very appreciated. How about the multiple quotes which say that Anakin lost the duel due to his mental hinderances? It's ascribed as the primary reason for his defeat. I can understand that he is not at his best, but nothing to my knowledge indicates any vast disparity. See above. His mental issues are attributed as the reason he lost which should indicate that they were indeed pretty significant. Especially since he's credited as a 9 whereas Obi Wan was an 8 and the gap between tiers is comparable to The Ritcher Scale. Meanwhile, several sources indicate the opposite. I assume you're talking about the sources which list Anakin as a 9 and the fact that he's stated to be stronger than KF Vader. The problem with these is Anakin may have that power but that doesn't mean he can use it properly or focus it which of course was the primary reason he lost. I'm down to debate this although I'll probably only reply a couple of times as I'm lazy when it comes to responses. Mostly agreed except for ROTJ Vader and ROTJ Luke's placements. Imo they should be equal to ROTS Kenobi. I feel like Kenobi's experience should edge him out over RotJ Luke. Anakin. Vader is certainly incapable of making him sweat in a Force duel and in sabers he's impossibly outmatched. Fair enough although it's not as if Vader's experience gave him the edge against Luke. If you go by Fightsaber Vader had the edge in experience but it was offset by the disadvantage of his cybernetics. RotS Kenobi has the advantage in both experience and a fit body. QUOTE 4 is in dispute. Moving forward, however, I would agree that Anakin > Vader but not <<<<Anakin. I think that fightsaber has been replaced by canon-more than one source.